Tiwa Savage’s estranged husband, Teebillz, has addressed rumours of the alleged sexual relationship between the first lady of Mavin Records and afro pop singer, Wizkid. In an Instagram post that he has now deleted, Teebillz said Wizkid was his little brother and it was therefore impossible for him to be in a sexual relationship with his ex-wife. 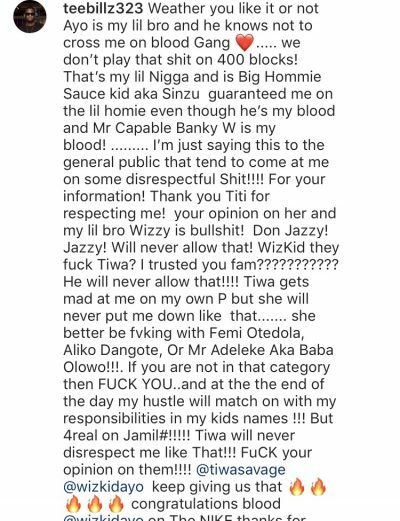 He also said that for the respect of their child, Jamil, Tiwa Savage cannot agree to a sexual relationship with Wiz Kid. He, however, urged anyone with evidence of a sexual relationship between the duo to speak up. He also said that it was better she rolled in the hay with billionaire businessmen, Aliko Dangote, Femi or Adeleke. The marriage between Tiwa Savage and Tee Billz hit the rocks in 2016 after five years of being together. The singer revealed that her husband cheated on her and has a child out of wedlock. Teebillz suffered a meltdown in 2016 when their marriage broke down irretrievably during which he attempted to commit suicide by jumping off a bridge in Lagos. He later accused his wife of sleeping with her colleagues like 2face Idibia, Don Jazzy and Dr Sid. He also accused her mother of witchcraft. Tiwa responded by accusing him of infidelity, substance abuse, stealing and cruelty. Teebillz later went for counselling for depression and the two are presently co-parenting their son, Jamil.